Your kitchen floor can set the entire atmosphere of your kitchen. Making the decision to remodel your kitchen is an easy one, it is essentially just one yes or no question that is easy to answer. Yes, you do want to remodel your kitchen. However, remodeling your kitchen does come along with one very difficult question: what kind of flooring do I want for my kitchen? With so many options, it can be easy to feel overwhelmed and indecisive when it comes to trying to find the right flooring option for you. 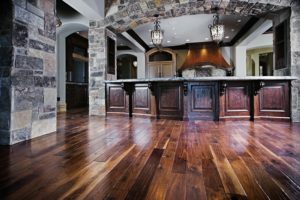 If you are in fact having difficulty picking a flooring option for your kitchen, then perhaps you will realize one of these options is the one you have been looking for. When it comes to flooring, it is hard to go wrong with hardwood. As far as flooring goes, there is not really any other options that offer the same warmth and obvious visual appeal that hardwood does. Hardwood floors are never out of style, so you will never have to worry about your kitchen looking outdated. They also come with the added benefit of durability and require very little maintenance. Vinyl flooring offers a very similar look to hardwood, but has a few differences. For starters, it is cheaper than wooden flooring. It is also both water-proof and stain-proof, so you will not have to worry too much about cleaning up any spills or any noticeable marks being left after they are cleaned. If you spend a lot of time in your kitchen, you will also enjoy and appreciate the fact you can get cushioned vinyl flooring to make it easier and softer to walk and stand on. If you wish to go with a tiling for your kitchen, then look no further than ceramic tiles. They are the most popular form of tile flooring thanks to its outstanding strength-to-weight ratio. The clay and quartz sand mixture flooring offers a dynamic visual appeal that you unfortunately just cannot quite get from a wood or vinyl flooring option. You are also given more design options with ceramic tiles, or even other types of tile options if you choose to go with one of them, like porcelain. This entry was posted on Friday, March 16th, 2018 at 4:19 pm. Both comments and pings are currently closed.